I've seen a lot of great natural eye creams, but few are vegan and even fewer are also gluten-free. 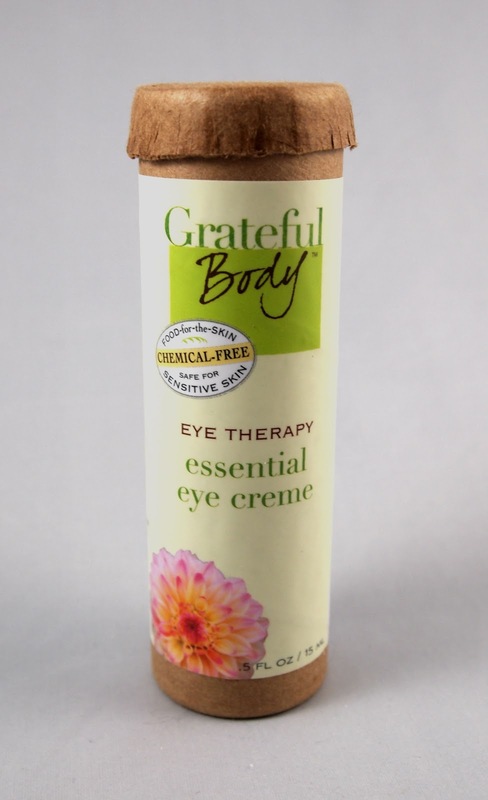 One of these rare eye creams is by the company Grateful Body, who only makes gluten-free and vegan products and uses extremely gentle ingredients. Below is a review of their Essential Eye Creme. 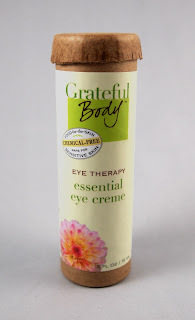 Grateful Body's Essential Eye Creme is an extremely gentle eye treatment. I love how it is vegan, gluten free, and filled with many organic ingredients. The texture is somewhere between cream and liquid, and only a small amount is needed with each application. Given the quality of the ingredients and the number of applications each bottle provides, $40 is a reasonable price for several months of product. It is a nice cream for improving texture (puffiness, fine lines and wrinkles), but the effects on under-eye circles may be more gradual. There is very little I would change about this product, except that I would love to see it more widely available in retail outlets. If you're looking for a safe, organic, vegan and gluten free eye product, this is an excellent option. I have one full-sized eye creme (a $40 value) available to give away to one lucky reader! One winner will be chosen at random from all eligible entries. Just leave a comment through the Rafflecopter widget below stating your biggest concern in your eye area (dark circles, fine lines, etc.). Additional entries are available for posting this giveaway Twitter (this can be done daily for up to one additional entry each day, also using the widget so you get credit). Contest ends 6/15/12 at 12:01 AM EST. Best of luck! My biggest concern is dark circles. Dark circles are my concern.